An exciting theatre inside Castleman Hall on the campus of Missouri S&T. Leach Theatre is located in Castleman Hall at 400 W. 10th Street, Rolla MO. 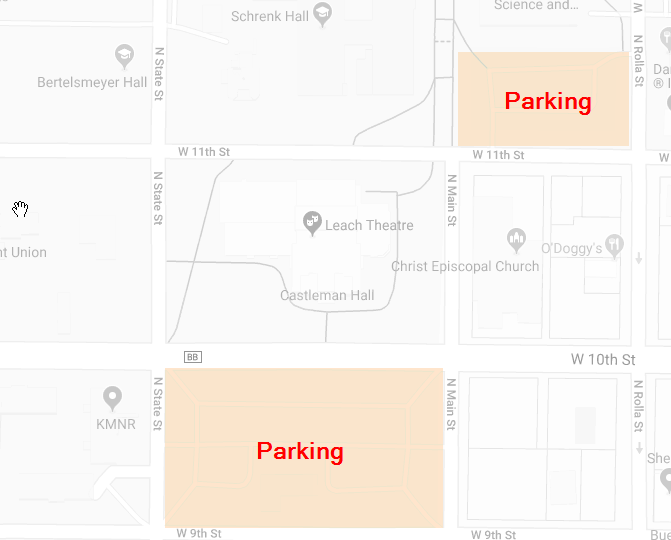 There is plenty of free parking available across 10th Street between Main and State, or by Centennial Hall at the corner of Rolla and 11th. Signs will indicate a permit is required, but this does not apply during evenings and weekends. Immediately after you cross State Street, you will see Castleman Hall on your left. Parking is available on your right. Tickets are NOT required for small children who will be seated on laps. One ticket = one seat. One seat = one ticket. We encourage you to purchase a separate seat for your child if possible, which will improve the experience for you and your child! We keep our youth rates as low as possible so that everyone can enjoy the experience of live theatre. Youth tickets are for guests 16 years old and younger. Wheelchair access and seating is available. Companion seats can also be set up next to wheelchair seating. Due to the location of the handicap access in the building, handicapped patrons requiring special seating assistance should arrive at least 15 minutes prior to show time. We also encourage you to contact our box office for any assistance to ensure that your visit is as simple and comfortable as possible! All credit card data is encrypted and never stored anywhere. Patron name, email, and other data will never be shared. Our ticketing system is in strict compliance with the Payment Card Industry Data Security Standard (PCI DSS). We are PCI Level 1 compliant and certified by Authorize.net. This means we meet the highest standards for data security!